This was our television when I was a kid. 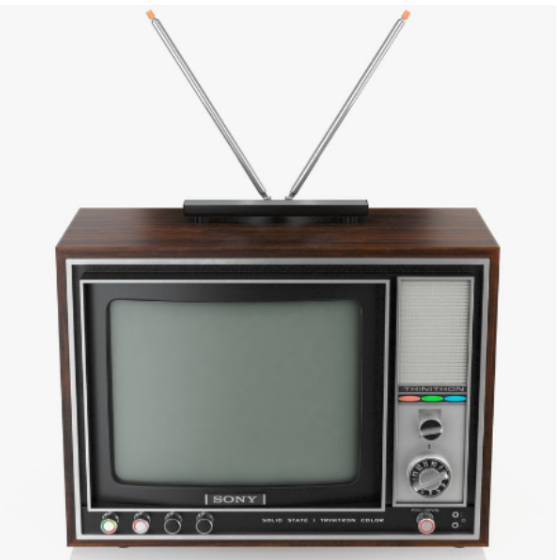 Except the dial on our Sony Trinitron was higher up on the right hand side; I remember this because eventually it broke (from little sisters turning channels really fast) and we had to take turns holding the dial in place. Picture it: me in my pink Sassoon sweatshirt, hair feathered, hovering to the right of the set so all sisters could see, hand on the dial, trying to stay as still as possible until Three’s Company was over. I think of this scene whenever I insist on a Friday pizza and movie night. The boys like the pizza part, but it all falls apart when it comes to choosing something to watch. Eventually we squish in together and one slinks off to watch something else, somewhere else. It drives me crazy. Back in my day… we all had to watch Three’s Company together, taking turns holding the dial until an arm fell asleep. We worked as a team. We could say the same for take-out. Back in my day… alright, enough of that. But I was sad to hear my friend say how thrilled he was when his whole family ordered separate meals from Uber Eats: different deliveries from different restaurants for everyone in the family. Did you eat together at least, I asked? No, it was sushi in the dining room, Lebanese in the kitchen, and a few in the basement with burgers. Of course we all need a little culinary rescuing from time to time. Separate meals means harmony, and who’s kidding who, personalized delivery is the way of the future. But if we cruise along like this, will our kids be able to compromise in life? Share? Work as a team? These thoughts were on my mind when I invited our twin nine-year old God children, their siblings and parents over for dinner last weekend. 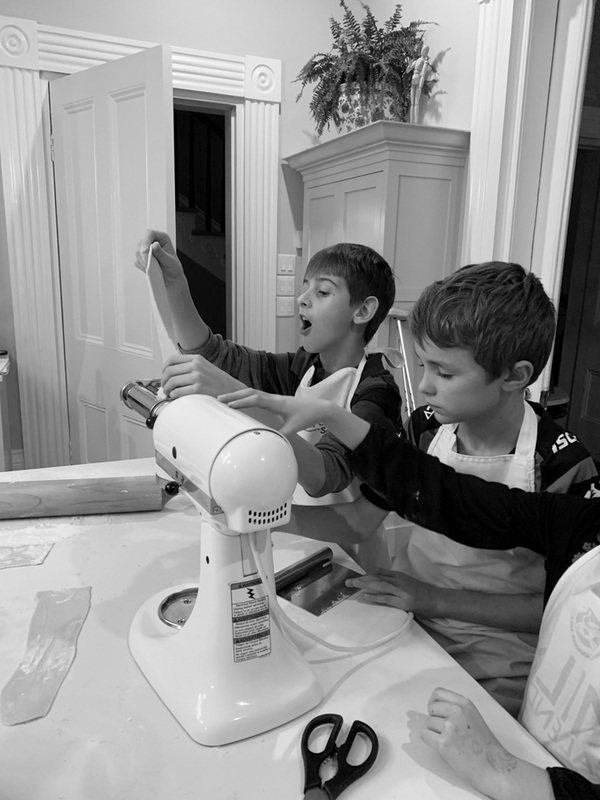 The twins, my youngest and I would make fresh pasta together, then we’d all eat it together: a kid team-building exercise with edible results. “It’s just like a play-doh hair shop!” said Jess. When we cut the dough in half to test for air pockets, Jess’s twin Nate said, “the dough looks sedimentary rock!” We talked about Remembrance day. They sang me the song they’d be singing at the Remembrance Day ceremony at school. They cracked eggs. 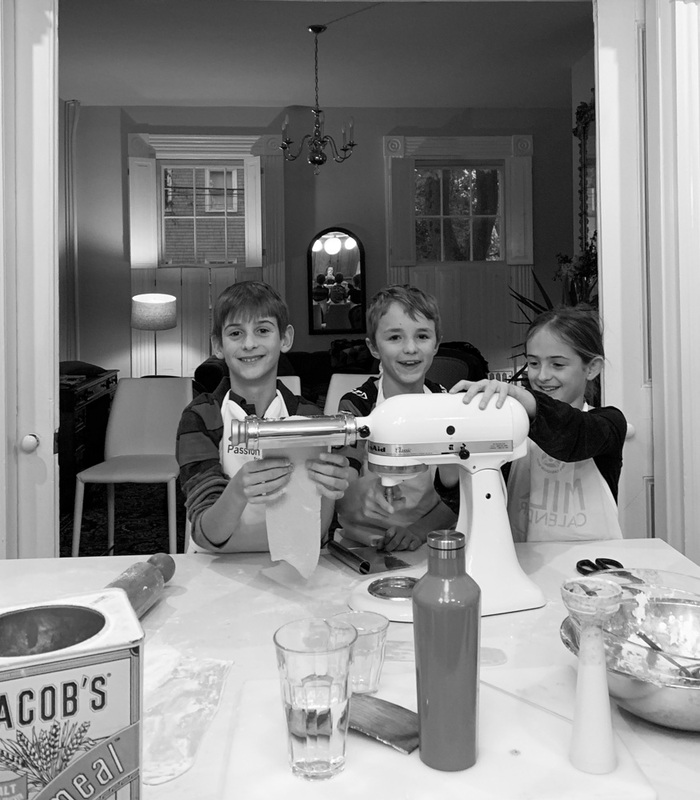 They kneaded dough. They fed it through the machine, assembly line style, fighting over whether it would be fettuccine or spaghetti. They settled on a little of each. I made a big bowl of pesto and grated a pile of parmesan. We set the table, wiped down the counter and cooked the pasta in a big pot of salty water. We served it up to all ten of us, then we ate it. Together. 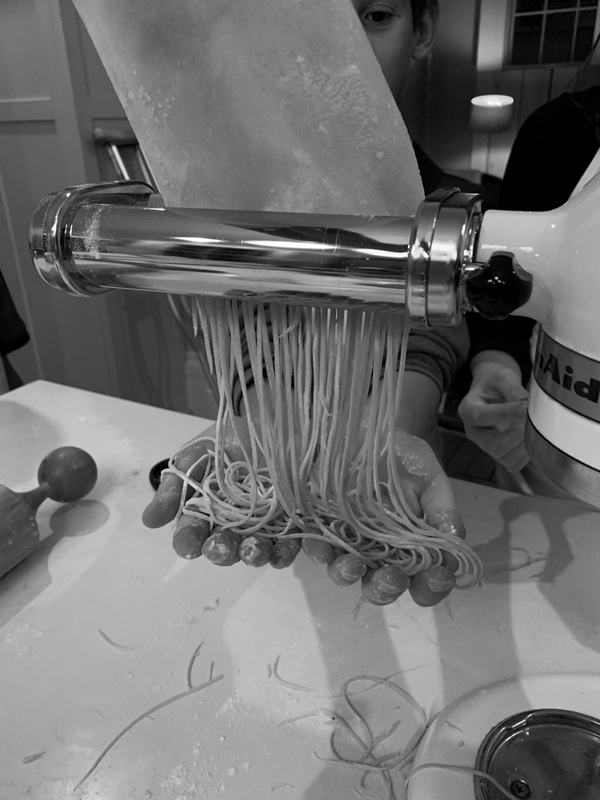 Later that night as I packed away the pasta maker, I thought how much patience is required for nine year olds to feed fat spheres of dough through the machine, again and again, forward, backward and folded until thin. But then again, it’s easier than sitting in a dark basement, arm on a dial until the commercial break. And there’s pasta at the end, topped with pesto and pile of parmesan. They took one for the team AND everyone won. At this point slice the dough into quarters, then follow your pasta maker directions. Or, try this tutorial from thekitchn – the recipe is slightly different, but the method is the same. 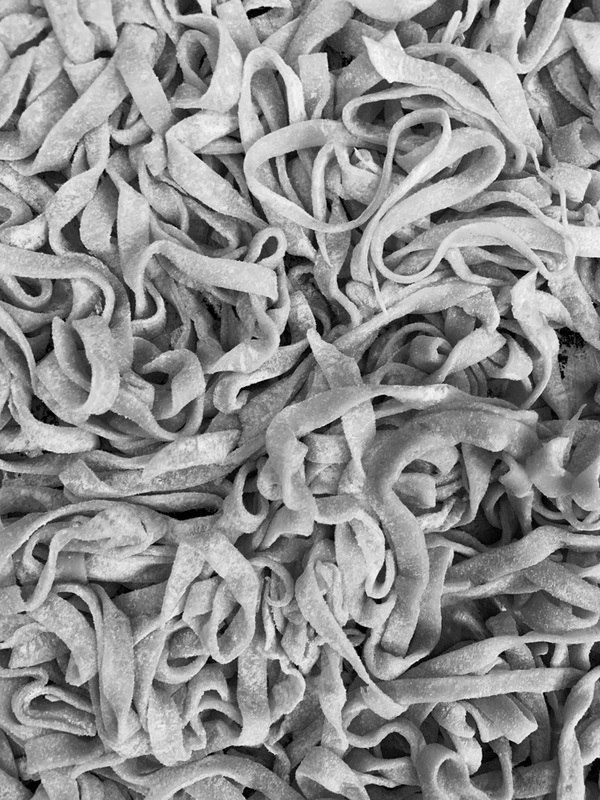 *A note on flour – 00 Flour or farina di grano tenero, which means ‘tender’ or ‘soft’ flour, is a finely sieved flour used for making pasta and cakes in Italy. If you can find it, great, but if not, that’s ok. I used regular all purpose flour here.